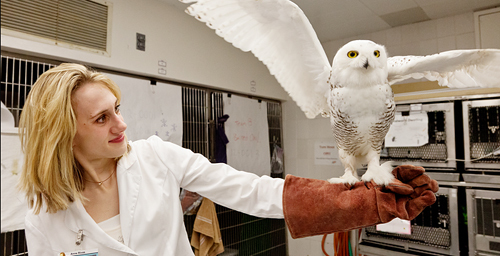 Qigiq, an injured snowy owl, shows off his progress to Anne Rivas, the senior manager at the UI Wildlife Medical Clinic, who has been in charge of his care since he arrived at the clinic in January. The bird's injured left wing is immobilized with a splint while it's healing. Qigiq has undergone two surgeries to repair the fractured humerus. The rare bird will complete his rehabilitation at the Raptor Center in Decatur before being released back into the wild. Anne Rivas, who's in charge of care for the rare owl, gave him the name and hopes that eventually he'll be able to fly the hundreds of miles back to the Arctic Circle. Rivas, the senior manager at the clinic, suspects Qigiq - pronounced KWIG-ick - may not have been much of a hunter and was surviving on road kill and was most likely struck by a car while looking for food. She thinks Qigiq was a part of the unusual southern migration of snowy owls this winter caused by a shortage of lemmings, the birds' usual source of food. 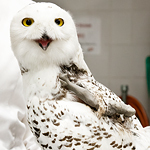 An ornithologist who had seen Qigiq standing for several days in a field in Tolono brought the bird to the clinic. The humerus bone in Qigiq's left wing was badly broken. The fracture is near the joint with the bird's body. Because Rivas and her team are concerned Qigiq could wind up with a limited range of motion, they're frequently massaging the ligaments in his wing. "Physical therapy is very important for him," Rivas says. When Qigiq first arrived at the clinic he was extremely malnourished and was kept on a liquid diet. He since has undergone two surgeries to repair the wing. If everything goes according to plan, it will take four to six weeks for the fracture to heal. 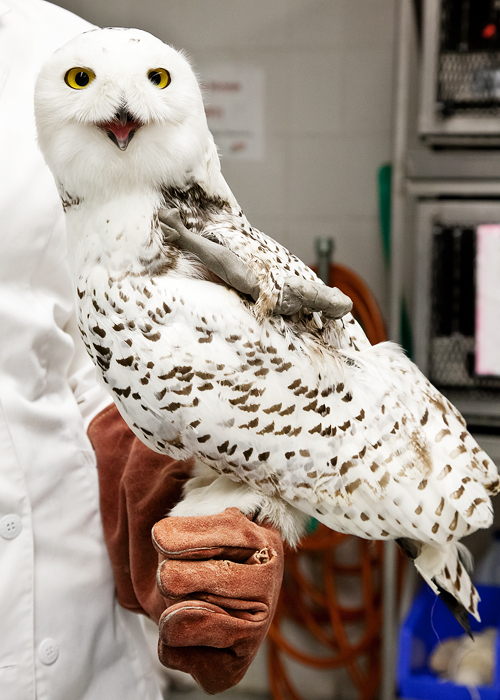 After the injury heals, the Illinois Raptor Center in Decatur will work with Qigiq to build up his strength and endurance. Flight cages and hunting simulation will allow him to sharpen the skills and stamina he'll need when returned to the wild. Rivas and her team said they're optimistic about Qigiq's recovery although they haven't put an exact date on when he'll be able to be set free. Updates on Qigiq's care and information about an upcoming fundraiser for the clinic, "Doodle for Wildlife," is available at http://vetmed.illinois.edu/wmc/.